Excellent research work has been done in the field of “chronic pain,” however; few physicians and even fewer veterinarians are adequately familiar with the concepts, manifestations, etiology and appropriate treatment of chronic pain. The many faceted syndromes of chronic pain have only come to legitimate standing in human medicine during the past 30 years. Similar types of syndromes in the equine and companion animals are seldom recognized in the world of veterinary medicine. However, an understanding regarding the concepts of etiology and treatment can be of immense value to the clinical practitioner and the patient. Chronic pain, as distinct from acute pain, distinguishes itself by its persistence in the absence of any inflammatory disease or any evidence of a detectable injury. It must be emphasized that this type of pain is very real phenomenon! It is a markedly debilitating condition that is a frustrating for both the physician/veterinarian and the patient. Until brought into light in the human field by such physicians as Janet Travel, and David Simon3 in a definitive work on the subject, patients with chronic pain were generally considered by medical profession to be hypochondriacs and psychosomatic cases. Patients were frequently, (and in many instance still are) referred for psychiatric evaluation, counseling and therapy. 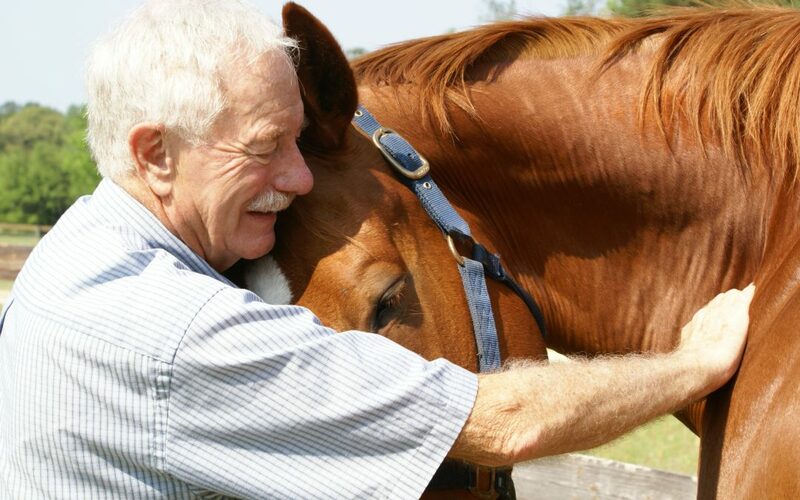 In the equine there is a strong tendency to dismiss pain as behavioral or training issues. As a prey animal, the equine reacts to pain by avoidance or aggressive tactics if flight or avoidance is not an option. 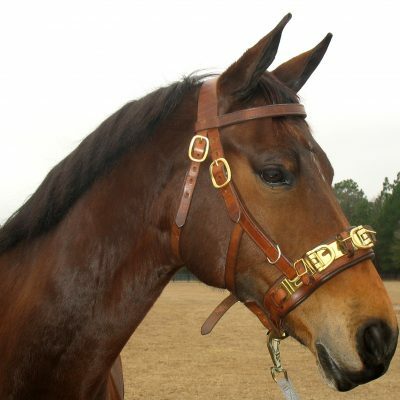 Much of the “mis-behavior” exhibited by horses is response to pain. There are at least two other distinct types of pain that need to be defined and differentiated from chronic pain. These include nociceptive pain of the type that is incurred with a wound, sprain, strain, or a burn, i.e. an immediate pain. In and of itself the lesions generally heal and pain manifestations disappear and do not lead to recurrent pain. The other type of pain is associated with inflammatory conditions. Inflammatory pain is generally self-limiting unless it is associated with conditions such as rheumatoid arthritis. Chronic pain in contrast to these other types is distinguished by a lack of evidence of current trauma or of inflammation. However, if one delves (often years back) into the patient’s history it is frequently discovered that there has been prior injury to the now painful area. History may also indicate that at some period before the onset of chronic pain significant “over-use” was involved. Relating this to equine medicine, over-use situations are a prevalent fact of life in the world of equine competition. Other major factors in the production of chronic pain in all species include the development of spondylosis and a resultant nerve root inflammation, i.e. radiculopathy. Radiculopathy also is a factor in acute pain of spinal origin. The field of psycho-neuro-immunology, addressing relationships between body and mind, is an exploding medical field (recognized in traditional Chinese medicine for centuries). Although this connection can be somewhat more difficult to define in animals, information obtained from a good history, can elicit information from an observant owner such that a connection between soma and psyche can be drawn in animals as well. Psychological aspects (e.g. fear) create stress. The body then manifests ongoing physiological responses as response to that stress – especially stress applied over long periods of time. 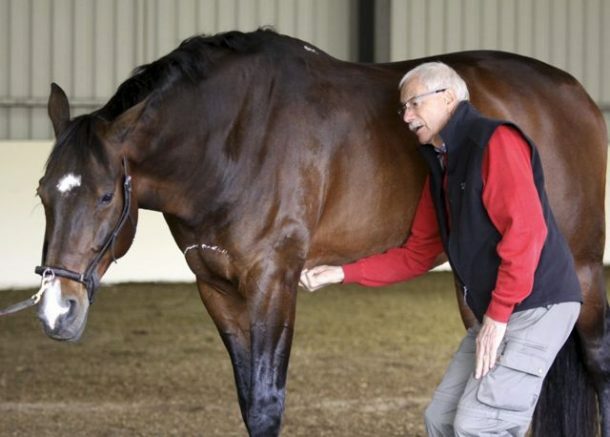 In the equine those stresses eventually lead to pain, decreased performance, subclinical and eventually frank lameness. In the horse, the history and role of stress cannot be over-emphasized when evaluating the possibility of a diagnosis of chronic pain and acute pain from such stressors as as speed (as in racing), strength (as in pulling), isometric contraction (as in dressage), fatigue from too many contractions (as in endurance). . Horses under work and mental stress are often immune compromised to some degree. The reasons for compromise are many. Consider the stress that is incurred in heavy showing schedules, transportation stress, stress associated with shipping long distances, isolation stress and stress induced by the thwarting of herd behavior. Immunization can also produce stress and result in an up-regulated adrenal response. Animals under stress from any source are poor candidates for vaccines and for worming. As a minimum, the immune response to the vaccines is compromised and worse, the procedures may add to the level of immune incompetence that the horse is already experiencing, Stress and immune compromise can lead to recurrent manifestations of chronic pain and lameness. Proven syndromes in the human field that are linked to stress include myofascial pain in the “fright and flight” muscles e.g. temporal mandibular joint syndrome, irritable bowel syndrome, leaky gut syndrome and (headaches in the human). There is reason to suspect that when we see these same or similar syndromes in our equine patients that they too are likely related to the soma-psyche stress cycle. Unlike acute pain, coming to a diagnosis of chronic pain syndrome often has to be achieved by ruling out other sources that can cause pain. A prime rule out would certainly include recent trauma. It would also include rule-outs in the category of degenerative joint disease. (It must be noted that some degenerative joint disease can be the result of chronic pain itself. This will be discussed in more detail later in this paper. Functional disease i.e. internal medical conditions must also be ruled out as a source of the observed pain. Conventional diagnostics, including chemistry, and the various imaging techniques should be employed. The most common form of Chronic Pain Syndrome is often manifested as a “Myofascial Pain Syndrome” (MPS). A search of the literature historically provides at least forty-five names used for the syndrome though the last 100 years4. This multiple nomenclature has lead to much confusion and disagreement within the medical community. A well documented and prevalent variant of Chronic Myofascial Pain in the human patient is fibromyalgia. The signs of fibromyalgia can provide the basis for a model adaptable to our non-human patients. The main human patient complaint is that “I hurt all over my body.” In the horse one, not infrequently, finds general body soreness. Fibromyalgia (FMS) patients describe the pain as intense and crippling. They indicate that the pain is nagging and ongoing. Though there are periods when such patients are relatively free of pain, they experience recurrent acute episodes. Lameness associated with chronic pain tends to be non-localized and is, therefore, is often difficult to identify by conventional means. Lameness associated with myofascial pain and contracture is not ameliorated or eliminated by nerve blocks. This form of pain does not exhibit radiographic changes, or even notable evidence of its presence with the use of nuclear scintography. The clinician must look back to a history of reoccurrences of such sub-clinical lameness or declining performance where there was no history or evidence of associated trauma. The clinician must also look for pain symptoms that occurred following a very minor trauma, and must seek and evaluate any history that would reveal chronic stress factors. It becomes necessary to be able to identify myofascial pain. A Chronic Pain Syndrome (CPS) commonly seen in horses that produces all the typical signs of MPS is a diffuse myofascial pain response that has, in the author’s opinion, been erroneously described by some veterinary acupuncturists, as a form of “equine herpes.” The syndrome manifested, however, is very real and mimics all the signs and diagnostic difficulties of MPS and fibromyalgia in man. Signs include performance deficits, pain in the gluteal muscles that is often initially more prevalent on the left side. The loin area is prone to spasm when palpated. Pain in the hamstrings is common and demonstrates a marked pain response to palpation along the groove between the semitendinosus muscle and the biceps femoris. Typically a more sharp withdrawal response is noted on the left side of the horse. Pain may also be elicited when palpating the brachiocephalicus and sternocephalicus muscles. Low-grade lameness is a common finding – the horse is typically described as not “coming through behind.” A clinical diagnosis of stifle or hock problems is commonly made, but the pain and lameness or sub clinical lameness is not diminished by administration of NSAIDS such as phenylbutasone. The pain is often exacerbated by the use of steroids. Such pain is not abolished with regional nerve blocks and nuclear scanning renders no definitive pattern. This syndrome in the equine might most appropriately be described as a true myofascial pain syndrome. How then do we diagnose Chronic Pain/Myofascial Pain Syndrome if our usually diagnostics fail. Using a clinical diagnosis of fibromyalgia (FMS) in the human patient as an example, the syndrome is considered confirmed if the patient is exquisitely reactive to palpation of 15 of 21 “trigger points” that are statistically consistent in FMS patients. As in the case of man, the above described form of MPS in the equine also exhibits a very consistent group of acupuncture or trigger points that are exquisitely sensitive. These will be demonstrated in the lecture portion of this presentation. “Trigger Points” have been described as focal areas of hypersensitive loci located in myofascial structures. When palpated, these foci give rise to a larger area of pain in the adjacent tissues or in referred areas that may be some distance from the trigger point. Trigger points, like acupuncture points are found in muscle belly, in skin, in scars (areas of sensory deficit), as well as in tendons, ligaments and joint capsules. Trigger points are known to occur in periosteum as well. What the medical profession refers to as trigger points, correlates 70% to 75% with historical acupuncture points. An acupuncture point, in contrast to a trigger point are considered to be a zone or field of hyperalgesia that arises spontaneously from excitation of either somatic or visceral structures that are often significantly distant to the reactive point. Acupuncture points are also activated by local irritation in the local area. The most common muscles that develop myofascial trigger points and acupuncture points in response to overuse or stress are the muscles of “fright and flight.” These would include muscles in the forehand such as the trapezius muscles, the sternocleidomastoid group (brachiocephalicus and sternocephalicus), the masseter muscles, and the infraspinatus muscles. In backpain, the paravertebral extensor muscles very commonly develop points and zones of exquisite sensitivity. Due to the high level of innervation within the paraspinal muscles, trigger point/acupuncture point formation and pain to palpation is very common finding. In the hindquarters, the gluteal muscles and the “hamstring” group of muscles are the other muscles most typically involved. All the listed muscles undergo shortening when in “fright and flight” posture. To properly understand chronic pain it is necessary to review to role of afferent and efferent nerves. Neuropathy by definition is a nerve that is not functioning properly and eliciting its normal trophic (controlling) responses. There is sub-optimal level of signal transmission. A neuropathic nerve exhibits both functional and pathologic changes. According to C. Chann Gunn, in his book, “Treatment of Chronic Pain,”5 Gunn states that spondylosis of the spine is the most common cause of neuropathy. He further states that the spondylosis leads to radiculopathy (inflammatory response in a nerve root). In spondylosis, morphologic alterations occur in the intervertebral disc. As the process continues, it leads to structural disintegration and morphologic change. Other causes of neuropathy that need to be recognized and ruled out include trauma, inflammation, metabolic, toxic, infection, neoplasia, and degenerative changes. The spondylosis / radiculopathy complex is a nearly universal condition in both people and animals. It increases with age and in some instances is familial. The onset of spondylosis is gradual and relapsing. Pain response can remain quiescent until triggered by insults so minor and that commonly occur in ordinary day-to-day living situations. These initiating trauma insults often pass unnoticed by the patient. The recognized features of neuropathic pain are numerous. The most key feature of chronic pain is the recognition of pain in the absence of ongoing tissue damage. Other features include a delay in onset after a precipitating injury; a searing or burning or deep aching pain; the occurrence of brief “shooting pain” or stabbing pain; and/or pain that occurs in a region of sensory deficit such as scars. It is noteworthy that a mild stimulus can cause allodynia. Allodynia is described as an extreme and hyper-reactive response to a minimal pain stimulus. With repetitive stimulation of triggers, such as applying light to moderate pressure over the muscle with the flat side of a needle cap a stronger pain response is elicited. In the myofascial covering there is, what is termed, a marked summation response. Summation response is exhibited as an increasing level of pain each time stimuli are repeated. The increasing pain is accompanied by spasms of the target muscles. In response to the muscle shortening, significant loss of range of motion in joints can occur as, often, both the associated agonist and antagonist muscles undergo shortening. An amazing number of targets are subject to the partial denervation and its resulting supersensitivity syndrome. Clinically skeletal muscle would be first on the list. However, many other critical structures such as smooth muscle, spinal neurons, sympathetic nerves, ganglia, adrenal glands, sweat glands and even brain cells are known targets. Recognition of the importance and wide distribution of the denervation-supersensitivity phenomenon requires that we look at many disease processes in a totally new way. This is an area ripe for veterinary medicine research. Clinical manifestations are especially those associated with the exquisitely reactive trigger and acupuncture points. Additionally, there are autonomic / trophic (regulatory) responses such as patchy sweat areas, and piloerrector responses seen in the human and equine patient. In the equine athlete areas of patchy sweat may occur hours after exercise. An understanding of radiculopathy and the responses to it, may point the way to recognizing a cause for the mysteriously delayed onset areas of sweating in the equine. It merits further research. The presence of muscle shortening has deleterious effects on the tendons and ligaments and subsequently the joints. Unrelenting muscle tension on these structures may be the precipitating factor in a number of pathologic conditions that we frequently see in horses. Such conditions likely include sacro-iliac pain, bicipital bursitis, epicondylitis, hock and stifle degenerative changes, suspensory pain and tearing, and in chondromalacia of the stifle joint. The continuous muscle tension creates an ongoing repetitive micro-trauma to the collagen structure of the associated tendons as well as to the ligamentous structures when use of the joint occurs (as in locomotion). The result is replacement collagen in tendons and ligaments that is weaker and lacks adequate cross-links. The tendon response is a thickened (enesthesopathic) tendon that remains weak and thus, subject to further trauma. Acupuncture and trigger point therapy and myofascial therapy can ablate the pain sites and allow the muscles and associated structures to relax and thus take pressure off the involved joint. This response will likely prove to be the most significant reason that acupuncture, trigger point, and myofascial/neuromuscular work can provide relief in these conditions. The relief is sometimes profound and can be very long lasting. The single most effective treatment known at this point in time for acute and chronic muscle hypertonicity is the placement of needles into the hyperactive neural points whether they are acupuncture points or trigger points. Needling of active points may include a significant number that are neither traditional nor transpositional acupuncture points. The procedure as advocated by C. Chann Gunn is referred to as “intramuscular stimulation” (IMS).7 In the case of myofascial pain, latent points and a Chinese “Ah-shi Points” may well be more important than an anatomically defined points whether transpositional or traditional. This may also be compared to Japanese acupuncture in which precedence is given to the “presently active point” rather than to the strict anatomical described location of a point. In treatment of MFP, it is important to eliminate all such points or the patient may actually exhibit worse symptoms after treatment. Dry needling into the points has been found to be as effective as, and safer than injecting compounds such as cyanocobalamine or local anesthetics into the points. The placement and stimulation of “dry” needles has proven to be more effective than the use of acupressure or photon therapy (“cold” lasers). This is, not to say that these types of therapy have no value in the treatment of chronic pain and will be discussed later. The placement of needles creates an area of micro-damage within the tissues. Two mechanisms involved in the pain control cycle are release of inflammatory products and the creation of a “current of injury.” Acupuncture needles, placed and repeatedly manipulated in and out injure the tissue and result in a “current of injury” that provides an ongoing stimulus from five to 10 days during the healing phase of the micro trauma. The nature and history of “current of injury” is well documented and explained in “The Body Electric” by Robert O Becker, M.D.9 To achieve the same level of results – lasers, deep tissue massage and acupressure all require more frequent treatments and the treatments need to be continued over an extended time frame. Micro-trauma induced by the placement of needles also stimulates a local inflammatory response at the site. Perhaps it is because of the great number of nerve endings and the increased microcirculation in and around acupuncture points that the inflammatory response is greater than when needles are placed in “sham points.” Substances such as bradykinin, release histamine from degrading mast cells. Degrading mast cells also release serotonin, which in turn potentiates the action of bradykinin on Group IV afferent nerve fibers. Sensitized C-sensory afferents release substance P, histamine from mast cells and serotonin from platelets. This process sets up descending pain inhibition from the central nervous system that blocks further afferent pain response. Since stress plays such an important role in the etiology of chronic pain, it has been the experience of this author that it is helpful to include acupuncture points that stimulate the immune system. Acupuncture induced responses regarding the immune system include an enhanced humoral immunity, increases in white blood cell counts, increased phagocytic activity, increased antibody levels and increased interferon levels.8 The enhancement of healing is aided by the increased microcirculation that occurs in acupuncture. Chiropractic has an extensive history in treatment of pain. An adjoining pair of vertebrae along with their associated structures (spinal nerve root, associated vascular structures and adnexal tissues) is known as a “motion segment.” When spinal joints are restricted in their range of motion, chemoreceptors are activated and low grade inflammation occurs. The inflammatory response leads to radiculopathy and further fixation of the segment. This then leads to spondylosis. That is to say, that one or more of the joints (one or more facet to facet or discogenic changes) may not allow normal joint movement within that motion segment. The resultant inflammatory response and radiculopathy result in neuropathy. In neuropathy there is poor signal transmission of the afferent signal and thus affecting the nature and appropriateness of the efferent signal. Muscles become shortened, i.e. hypertonic. Shortened muscles manifest pain. Microcirculation is diminished and this tissue temperature is lowered. In the chronic pain of Myofascial Pain Syndrome, dysfunction of the motion segment tends to soon recur. Thus, best results have occurred from use of acupuncture or trigger point therapy followed by chiropractic or osteopathic manipulation. Other follow up therapies of value include the use of lasers (photon therapy), and microcurrent therapy. The latter is applied via instrumentation and current is typically in the range of 60 to 800 microamperes of current. Recalling the phrase, “no muscle shortening – no pain,” stretching and myofascial neuromuscular release work can also be of great benefit since these physical therapy modalities help maintain muscle length and relaxation. Deep tissue massage can also stimulate the release of both acupuncture and trigger points. Aspects of these stretching, myofascial release, and deep tissue massage can be readily demonstrated to the client. With a little training, the client can then do beneficial follow-up therapy and minimize the incidence of recurrences. The physiology of treating pain with pain is a fascinating concept. Though the neurology was unknown to primitive cultures, they effectively practiced “treating pain with pain,” such as the insertion of acupuncture needles, chiropractic adjustment or deep muscle work. Considering the evidence for MFP and the Chronic Pain concepts of spondylosis/radiculopathy, denervation/supersensitivity phenomena, effects of unremitting tension on muscles, tendons, ligaments, joint capsules, etc., these very real conditions present new and exciting challenges for the way that veterinary medicine evaluates pain sources and their causes. Much is to be learned about the appropriate treatment of Chronic Pain Syndromes. It is the author’s hope that veterinary medicine will, with an open mind, rise to the challenge. Haussler, KK. , Erb HN. Pressure algometry: objective assessment of back pain and effects of chiropractic treatment.